PERU, Neb. 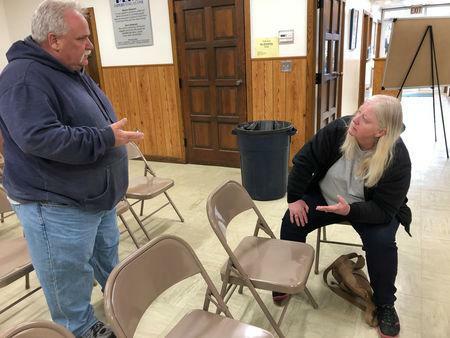 (Reuters) - When Jim and Rose Downing heard forecasts last week for dangerously high water in their Nebraska hometown on the Missouri River, they were nonplussed since their house had not flooded in 100 years. Rose is the third generation of her family to reside in the brick home in the Gunnysack Flats neighborhood near downtown Peru, Nebraska, and 2 miles west of a levee that townspeople said never faltered in the past. This time was different, as the fewer than 1,000 residents of Peru discovered on Saturday when numerous Missouri River levees were breached due to heavy rainfall and snow melt. This included the earthen barrier near Peru, about 60 miles south of Omaha, the Army Corps of Engineers said. “We had only about 40 minutes" to evacuate, Rose, 57, recalled. 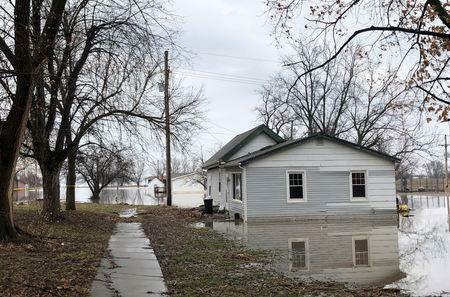 They scrambled when water began to infiltrate about an eighth of a mile from the house. “My husband was saying, ‘Get out of here, get out of here.’ As we were backing out of the driveway, the water was coming up the driveway,” she said. In the scramble, the Downings managed to grab their cat, Gunk, as well as a few clothes, a television set, a curio cabinet, bedding and their medicines. But their most of their furniture and appliances remain in the house, surrounded by water. 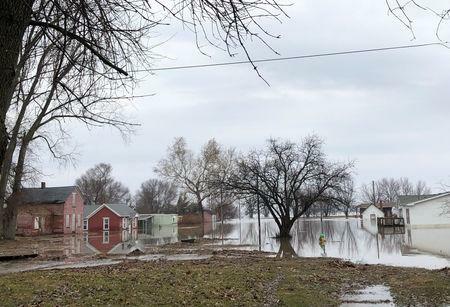 Parts of Nebraska, Iowa and Missouri have been inundated since late last week with floods that followed a powerful winter hurricane that slammed into America’s Farm Belt. The deluge has killed livestock, destroyed grains and soybeans in storage and cut off access to farms due to road and rail damage. At least four people have been killed in the region as a result of the flooding. Brett Adams, 39, a soybean and corn farmer who has a couple thousand acres on both sides of the river - which forms Nebraska's border with Missouri - said he wasn’t too worried by the initial forecasts, either. “The prediction that high water was coming wasn’t too concerning,” Adams said. “We’ve never had water go over the levee. But two days later, we learned the river was going to rise 15 feet and it was full panic attack." Adams began moving his farm machinery to higher ground. But the Downings still felt their own house was safe. Instead of making preparations, they said they helped Adams and other neighbors who lived closer to the levee move their possessions. “We were helping everybody else because we didn’t think it was going to get us,” said Rose, who works at the local Casey’s convenience store. Her husband works in a truck stop across the river in Missouri. Adams, a fourth-generation farmer, won’t have any crops this season. The Downings are now staying with friends in an apartment near Peru State College. They did not have flood insurance.